Comps, Comps and More Comps! Fly Casino offers you to soar high with 2X and 3X comp point days! 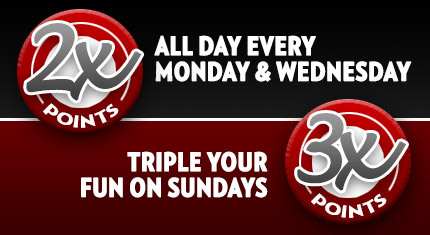 That’s right, earn an incredible 3X comp points this Sunday! Plus, you’ll also earn an awesome 2X comps this Monday and Wednesday! All games count. Sunday August 2nd, Monday August 3rd and Wednesday August 5th. 100% Bonus on Sunday from 00:00GMT until 23:59 GMT, all members on their first deposit of $/£/€30 or more will receive a 100% deposit bonus up to 100.00.